Thank you to the Committee and to Chairman Menchaca for the opportunity to provide testimony today. My name is Claire R. Thomas. I am a staff attorney with the Safe Passage Project and I submit this testimony on behalf of the Safe Passage Project today. I am going to speak to you today about a population of immigrants in removal/deportation proceedings whom we have not heard much about today – children. Safe Passage believes that no child should stand along in immigration court and that all children, regardless of their countries of birth, should be entitled to free, competent legal representation. Under current law, immigrants- including those who are under 21 and are unaccompanied- are not entitled to any government-provided legal representation in immigration proceedings. The Safe Passage Project tries to fill this gap. Professor Lenni Benson at New York Law School created the Safe Passage Project in 2006 to address the unmet legal needs of indigent immigrant youth living in New York State by creating an innovative pro bono model in which children in deportation proceedings are screened for immigration relief and then placed with pro bono attorneys and law student advocates who are actively mentored by Safe Passage staff attorneys, including me. To better explain our model, let me please begin with a story of a child in immigration court. Miguel is seven years old. The Customs and Border Patrol apprehended him at the Southern border of the United States. Miguel is taken to a juvenile detention center and the federal government interviews him and learns that his father is living in New York City. They contact Miguel’s father, José. After several weeks, they release Miguel to his father and hand them a packet of papers explaining that Miguel is in removal proceedings and will receive a letter that tells him when he must appear at Immigration Court in Manhattan. These papers explain that if Miguel does not attend, the Department of Homeland Security can order him deported. The day of Miguel’s hearing arrives. He and his father travel to downtown Manhattan at 8:30 AM. Miguel is in the courtroom. He wears his best shirt and his jeans are clean and pressed. He tightly grips the arms of the courtroom chair. He is so small that his feet do not touch the floor. The Immigration Judge is speaking to him slowly and kindly but Miguel turns his small face up to look only at the court’s Spanish-speaking interpreter. The judge is asking, “Are you here alone today?” Miguel responds, “No, I am here with my father.” “Where is your father?” the Judge asks. Miguel pauses. He looks at the judge. He turns his head to the left and looks at the government prosecutor from Immigration and Customs Enforcement. He turns to the interpreter. Slowly he says, “I don’t know. He is outside?” Miguel’s father has no papers. He is afraid – like so many immigrants- to come inside the courtroom. This scene is repeated with small variations every day at the New York Immigration Court. The Immigration Judges see many unrepresented people in the courts and now, a growing percentage of people facing deportation are children. The Department of Homeland Security apprehended more than 24,000 children in the fiscal year 2012. This number is triple the prior year’s apprehensions and the DHS is publically predicting that more than 60,000 children will be apprehended this year. Some of these children will be detained and most will be released to family members or friends. Despite the vulnerability of these children, federal law does not provide them with free counsel. Over 12% of the New York Immigration Court’s docket – more than 6,000 cases- involve juveniles. The Safe Passage Project finds that nearly 80% to 90% of the children we meet qualify for some type of immigration relief if the children have adults who are willing to assist them to secure such status. When Safe Passage staffs the juvenile removal docket at the New York Immigration Court each month, we bring approximately 10 law students, 10 volunteer interpreters, and 10-15 volunteer attorneys to interview the children. Based on these and follow-up interviews, the Safe Passage Project then recruits and mentors pro bono counsel who try to secure immigration status for each child. Safe Passage was incredibly successful in its first year, during which time it screened 215 children and placed over 60% with pro bono counsel. 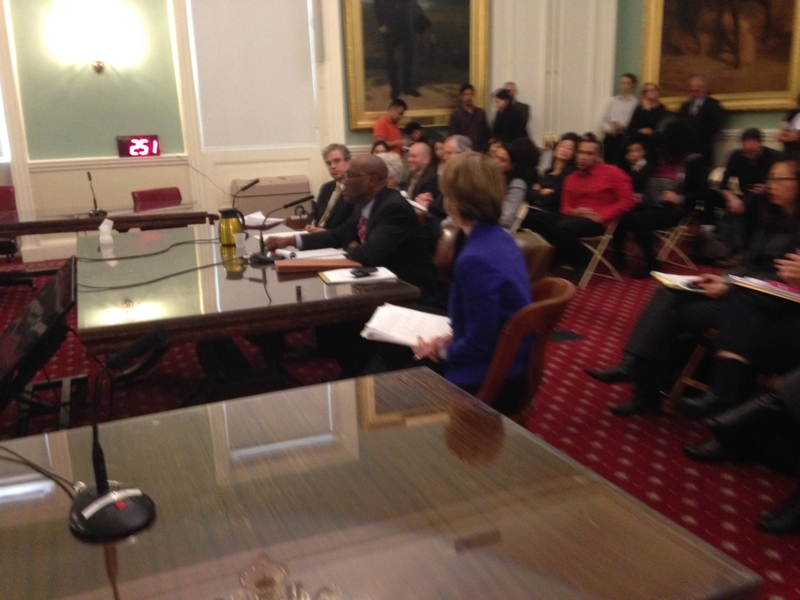 However, Safe Passage has found that there is a gap in New York’s representation of children in family court. While the family court is able to appoint counsel once a guardianship proceeding or custody proceeding has commenced, there is not a straight-forward path for the appointment of counsel for the child or his or her indigent guardian until a proper filing is made. Safe Passage helps to fill this gap and addresses the disconnect in New York’s appointment of counsel for indigent children in family court by guiding pro bono counsel and trying to assist pro se adults who are willing to seek guardianship or custody over these children. City Council support matters. Financial support would allow non-profit organizations to engage in the mentoring of pro bono attorneys and to deepen the skills of the 18-B appointed panel attorneys or lawyers for children in the Family Courts, whose assistance is crucial. Strengthening Safe Passage would make a huge difference in providing competent representation for immigrant youth in New York. This area of law—where children may need attorneys who are experts in family law, immigration law, and international questions of custody and guardianship— means that it is unlikely that any of our existing programs is adequately funded to help these children and their families navigate jurisdictional and procedural barriers. As such, programs like the Safe Passage Project are essential to bridge these gaps. We believe our model of recruiting and training pro bono attorneys, partnering these attorneys with law students, and working closely with a law school is cost effective and successful in expanding resources for these vulnerable children. We are happy to provide more information or more detailed testimony about these issues. We urge the City Council to remember the children. Thank you for your time, your attention, and your consideration.